Item Title: K&H Manufacturing Memory Sleeper Small Sage 18in.X26in.X3.75in. 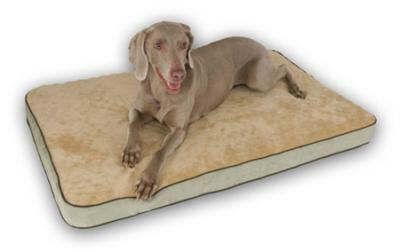 The K&H Memory Sleeper (Small Sage 18 in X 26 in X 3.75 in) is a beautiful, affordable way for all dogs to benefit from the memory foam bed technology. The attractive cover is removable for washing. The core is ingeniously designed for genuine memory foam comfort while affording ultimate support for any size dog. While the Memory Sleeper is wonderful for pets with bone, hip or joint problems this bed is also the ultimate in comfort. "Customer service after internet order processed was very helpful."